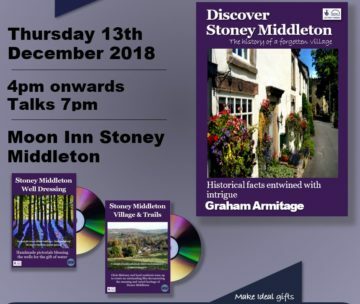 Stoney Middleton Heritage Centre Community Group invites you to join us on Thursday 13th December from 4pm onwards at the Moon Inn. Flyer for the Book & Film Launch. Special savings for items purchased on the day! Accomplished author and local resident Graham Armitage presents his village book. 4 years of meticulous research and writing has produced an outstanding book, telling the story of the village from the earliest settlers to the modern day. Talented Filmmaker Gavin Repton and journalist presenter Chris Maloney, teamed up with residents to create an outstanding film “Stoney Middleton Village and Trails”, documenting the amazing and varied heritage of the village. “Stoney Middleton Well Dressing” also filmed by Gavin Repton, documents the production of the 2017 well dressings. Newer Special discounts on Book and Film launch day! How I wish we could attend! Any chance any of this will be online? Also, I’d love to get several copies of the book. Any chance it can be shipped to US? Have a wonderful celebration of a very special village. Feel so honored to have a connection. Cheers!